हॉकिंग, स्टीफ़न (2013). My Brief History [माय ब्रीफ़ हिस्ट्री]. Bantam. आई॰ऍस॰बी॰ऍन॰ 978-0345535283. अभिगमन तिथि 22 सितम्बर 2013. बैर्ड, एरिक (2007). Relativity in Curved Spacetime: Life Without Special Relativity [वक्रिय दिक्-काल में आपेक्षिकता: विशिष्ट आपेक्षिकता रहित जीवन]. चॉकलेट ट्री बुक्स. आई॰ऍस॰बी॰ऍन॰ 978-0-9557068-0-6. बोसोलॉफ़, जॉन (1989). Stephen Hawking's universe: an introduction to the most remarkable scientist of our time [स्टीफ़न हॉकिंग का ब्रह्माण्ड: हमारे समय के एक महत्वपूर्ण उल्लेखनीय वैज्ञानिक का परिचय]. एवन बुक्स. आई॰ऍस॰बी॰ऍन॰ 978-0-380-70763-8. अभिगमन तिथि 22 सितम्बर 2013. फरग्यूसन, किट्टी (2011). Stephen Hawking: His Life and Work [स्टीफन हॉकिंग: उनका जीवन एवं कार्य]. ट्रांसवर्ल्ड. आई॰ऍस॰बी॰ऍन॰ 978-1-4481-1047-6. गिब्बंस, ग्रे ड्ब्ल्यू॰; हॉकिंग, स्टीफ़न विलियम; सिक्लोस, एस टी सी, संपा॰ (1983). The Very early universe: proceedings of the Nuffield workshop, Cambridge, 21 जून to 9 जुलाई 1982 [अल्पकालिक ब्रह्माण्ड:]. कैम्ब्रिज यूनिवर्सिटी प्रेस. आई॰ऍस॰बी॰ऍन॰ 0-521-31677-4. Hawking, Jane (2007). Travelling to Infinity: My Life With Stephen. Alma. आई॰ऍस॰बी॰ऍन॰ 978-1-84688-115-2. Hawking, Stephen W. (1994). Black holes and baby universes and other essays. Bantam Books. आई॰ऍस॰बी॰ऍन॰ 978-0-553-37411-7. Hawking, Stephen W.; Ellis, George F.R. (1973). The Large Scale Structure of Space-Time. Cambridge University Press. आई॰ऍस॰बी॰ऍन॰ 978-0-521-09906-6. 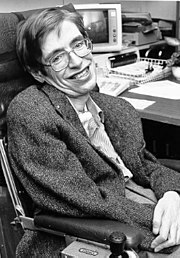 Hawking, Stephen W. (1992). Stephen Hawking's A brief history of time: a reader's companion. Bantam Books. आई॰ऍस॰बी॰ऍन॰ 978-0-553-07772-8. Hawking, Stephen W.; Israel, Werner (1989). Three Hundred Years of Gravitation. Cambridge University Press. आई॰ऍस॰बी॰ऍन॰ 978-0-521-37976-2. Larsen, Kristine (2005). Stephen Hawking: a biography. Greenwood Publishing Group. आई॰ऍस॰बी॰ऍन॰ 978-0-313-32392-8. Mialet, Hélène (2012). Hawking Incorporated: Stephen Hawking and the Anthropology of the Knowing Subject. शिकागो विश्वविद्यालय प्रेस. आई॰ऍस॰बी॰ऍन॰ 978-0-226-52226-5. Mitsumoto, Hiroshi; Munsat, Theodore L. (2001). Amyotrophic lateral sclerosis: a guide for patients and families. Demos Medical Publishing. आई॰ऍस॰बी॰ऍन॰ 978-1-888799-28-6. Okuda, Michael; Okuda, Denise (1999). The Star trek encyclopedia: a reference guide to the future. Pocket Books. आई॰ऍस॰बी॰ऍन॰ 978-0-671-53609-1. Pickover, Clifford A. (2008). Archimedes to Hawking: laws of science and the great minds behind them. Oxford University Press. आई॰ऍस॰बी॰ऍन॰ 978-0-19-533611-5. अभिगमन तिथि 22 सितम्बर 2013. White, Michael; Gribbin, John (2002). Stephen Hawking: A Life in Science (2nd संस्करण). National Academies Press. आई॰ऍस॰बी॰ऍन॰ 978-0-309-08410-9. Yulsman, Tom (2003). Origins: the quest for our cosmic roots. CRC Press. आई॰ऍस॰बी॰ऍन॰ 978-0-7503-0765-9. ↑ अ आ इ ई "स्टीफ़न हॉकिंग की ग़ज़ब दास्तां". बीबीसी हिन्दी. 22 सितम्बर 2013. अभिगमन तिथि 22 सितम्बर 2013. ↑ "Physicist Stephen Hawking dies aged 76". BBC News. 14 March 2018. अभिगमन तिथि 14 March 2018. 5 "स्टीफन हॉकिंग के 31 अनमोल विचार"